My 10 Most Recommended Carpentry Tools! I receive a lot of emails about our project videos and plans, and many of these are in regards to the tools we use, and those I would recommend. Good quality tools can make a huge difference in the overall quality and finish on any project. in response to those asking, I decided to add this page of my most recommended “Must Have” tools. I would like to say however, there is no tool that will perform well if it is not used in conjunction with sharp blades and bits. Good saw blades should be of a reputable brand and “Always” sharp. Same applies to drill bits, chisels and similar items – Dull tools are “DANGEROUS”. NOTE: I am listing tools I am familiar with and use, most on a daily basis. Many of the links on this page are affiliate links for Amazon.com, for which I earn a small commission if you choose to buy (at NO additional cost to you.). This small amount of revenue helps me run Country Life Projects and fund future projects. In our videos, we use a Dewalt 10″ sliding compound miter saw with a capacity to cut 60 degree angles. 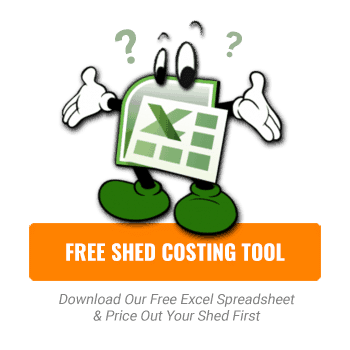 This is ideal for our shed project and the extra capacity is also ideal for any other projects you might tackle. A good miter saw ensures that all your cuts from framing through to finishing are going to be accurate and produce tight fitting joints. This not only looks much better, it will help extend the life of all your projects as glues will hold better and water, ice and snow will not get into the joints and initiate rot as quickly (or leaks etc). Why do we recommend the 12″ saw over the 10″? Yes is has extra capacity, but the main reason is the dust extraction. We found this design on the 10″ saw lacking and the 12″ was better. 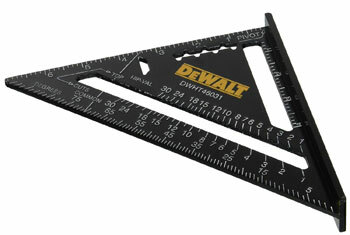 The standard blade that comes with the Dewalt Saw is not great, but it will work just fine for all your framing needs. If you plan to do more finishing work, invest in good quality “crosscut” blades with carbide teeth for finish work (minimum 60 tooth). Freud Diablo saw blades are a good value for the money – they are not top of the line, but they are very good for the price. At the current price on Amazon (possibly at your local lumberyard) you can’t beat this saw for the money. This particular model will cut 50 degrees to the left and 60 degrees to the right (great feature to have). Of all the tools you can buy for general framing work, a good circular saw is a must… and I stress a good one. In my opinion, nothing beats Makita, they are strong, durable, and cut square, straight and smooth. Dewalt is good too, but I have found that Makita performs the best, and offers the best value for your money. In particular, the Makita 5007MGA Magnesium 7-1/4-Inch Circular Saw with Electric Brake. This saw is a good size and weight and easy to use all day long. It is not the cheapest saw available, but if you watch for specials, it can usually be found in the $160 to $180 range. This is a saw that will last you a long time and likely exceed your expectations. All adjustments on this saw are easy to adjust and tighten and do not move or loosen. It is accurate and can produce “VERY SMOOTH” cuts with the right saw blade. I used it on a beach countertop with a straight edge and the resulting cut only required minimal sanding to finish it up – that kind of performance and satisfaction can’t be beat! 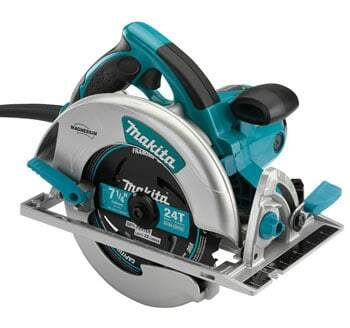 If you want a great circular saw, this Makita cannot be beat for the price. Available here on Amazon. If there is one set of tools you won’t regret buying, it has to be a cordless impact driver and drill. They will probably get used more than any other tool on this list. Not just for a shed build, but anywhere you need a strong driver or drill, and this Makita 18v combo kit “Won’t Disappoint”. Yes, in our videos we use a Dewalt impact driver and drill, but over the last 3 years, the Makita has become my favorite. 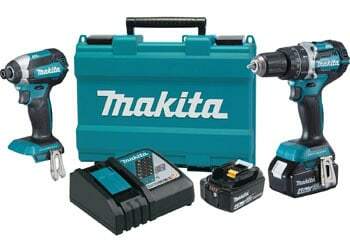 WIth Makita, I would estimate the battery charge lasts about 20% longer, and torque about 15% to 20% stronger. Charging of batteries to full charge from dead is roughly the same. The capacity of the Makita batteries seems to be better over the long haul as I have found the Dewalt to gradually hold less of a charge over time compared to the Makita (although both will lose some capacity as time and use goes on – cold weather can be an issue too). In addition, I found with the Dewalt drill, the chuck has a tendency to loosen off in the middle of drilling operations (a lot) – this can be a real pain, especially if you are on a ladder and the bit falls out, hence a trip down to go get it (provided it has not been dulled hitting concrete or stones etc). This seldom happens with the Makita Drill that comes with the XT269M kit (although it does happen on occasion). Both Makita and Dewalt are good kits, but i have to say, my go to driver or drill these days is the Makita. So, it really comes down to price or which one is on sale. Dewalt combo kits tend to come on sale more often and may be a better option if the price is a concern. If size and weight are important, the Dewalt are smaller and more compact, and would be a better choice. If performance is priority – I recommend getting the this kit from Makita (or a Makita kit of equal or greater caliber if the one below is no longer available). A table saw is a very nice addition to a tool collection for any DIY’er. A circular saw will only get you so far, and yes, you can use a them with a straight edge and get pretty good results, but it adds a lot of time to a project. 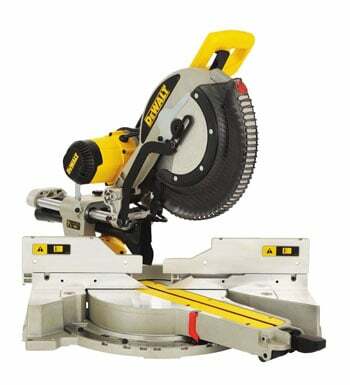 A table saw makes quick work of any ripping you may come up against and this Dewalt saw is a “Very Strong” work horse – despite it small size. With the right saw blade, this saw will not bog down and ripping 2x materials is a breeze. Even 4×4’s cut easily with this saw. Quick and easy blade height adjustment, angles too! It is important to note that few, if any, portable job site table saws will produce a super smooth cut. If you want that kind of performance you need a stationary saw or HD contractors saw – but these usually require 2 people to move and are not really intended for that type of use. They are also much more expensive. To clarify, by super smooth I mean a cut where it is difficult to see saw blade cut marks on the edge of the board… and if you took two cut edges and placed them together, there would be no space visible at all – in other words, very tight. In my opinion, Job site saws aren’t heavy enough, and aren’t made to deliver that kind of quality. I have used the Makita, Bosch and Ridgid job site saws and none were able to produce a super smooth cut. Some come with very nice features like the Ridgid, with the built-in bench setup, but all of these are more expensive than the Dewalt DW745. 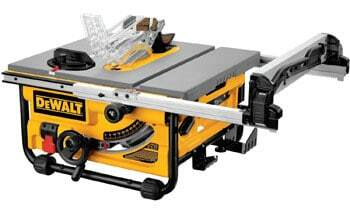 If you just want a really good, rock solid table saw, this Dewalt is it. Especially if you want to haul it around or take it from one part of the house to another or out in the yard (or a friends) – it is light enough to do this with ease. The saw and fence is amazingly strong and can take job site abuse. For the average DIY’er, this saw should easily give you a decade of trouble free service. Just remember that it is ideal for ripping lumber and trim and is limited to 20″ width for sheet goods. It is not for cabinet making and other work that requires really smooth cuts and wider rip capacity. 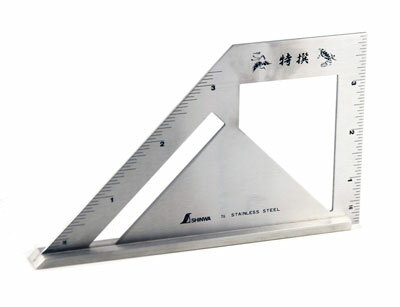 If your planning on doing a lot of projects that involve framing, you have to get yourself a Speed Square. I have sometimes called these a triangular square, but the most common name is Speed or Rafter square. 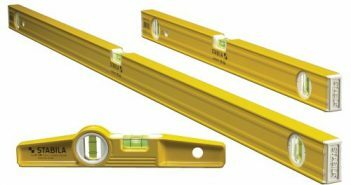 These are great for marking angles and pitch for rafters and simply marking off square cuts and layout marking for studs etc. The lip edge is one of the best features of this square – one for a pivot point and the other for holding the square tight to an edge for square marking. The #1 feature however is the fact that they will never get damaged and be “Out of Square”. The single piece triangle design is superior to the typical framing square design (L Shaped Square). There are a few limitations with the Speed square. First is the size, the largest you can get is 12″ so you are limited to a 90 degree length of 12″. The second, they are not great for checking the square of an edge as they cannot be set on the flat surface (face) of a plank to see if the edge is square to the face. So, this means you will still need an alternate square to those applications. There is one thing you cannot do without on any larger building project and that is reliable and accurate levels. The quality of any project begins with the use of a level and is used throughout the building process. Stabila is “THE NAME BRAND” for high quality levels. And typically this is reflected in the price tag. Except these, there are an awesome value for the price. 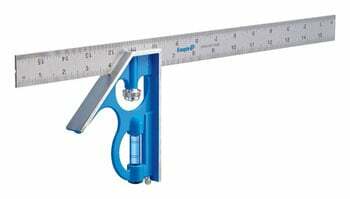 The set comes with a 48″, 24″ and torpedo level with rare earth magnets that are very strong. You can get away with cheaper levels like the Stanley FatMax levels, but if you want levels that will stay true year after year, you cannot beat the quality and price of this Stabila set of pro levels. They are light, not bulky and easy to handle. And as with all Stabila levels, Vial Accuracy is guaranteed for life! If you want great quality at a reasonable price, get one of these sets, you won’t regret it! Over the years I have gone through more chalk lines than I care to remember. Even those in the $20 range have not managed to last the test of time. Either the tip wears down and starts to damage the line, or the winding mechanism fails or the case breaks. In my opinion most are junk and one should not expect them to last more than a year with regular use. 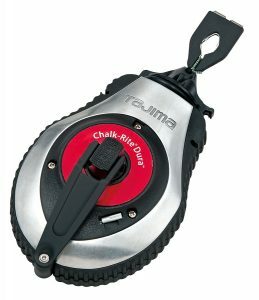 That is until I bought a Tajima chalk line. These are the only brand that exceeded my expectations and I have happily owned the same one now for 3 years (of moderate use). The overall quality is 3x that of any other brand I have owned in the past and the mechanical operations of these chalk lines is smooth and trouble free. You can feel the quality as soon as you open the package – and using them is equally satisfying. Smooth release and fast retrieval. End hook grabs solidly and lines are crisp and solid. The one shown here is very popular with over 877 reviews and the average is 4.5 out of 5 stars! Having a large square to check corners, mark off plywood or wide boards and so on is indispensable and it is hard to go without one for any type of project that involves framing. 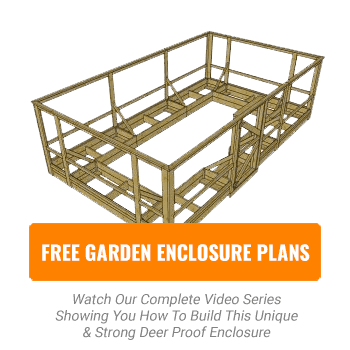 They are also the best option for laying out stairs, large rafters and roof framing. There are a large variety of brands available and I have found that there is little difference between brands like Starrett, Irwin, Stanley, Dewalt, Empire and so on. However, I do recommend buying those that are have a darker finish and light markings/increments for ease of use – especially if your eye sight is not what it used to be. As far as accuracy goes it should be noted that of all the squares you can buy, a 24″ framing square is the most likely to go out of square the soonest – No matter what brand you buy or how much you spend, it is good practice to check a framing square every couple jobs (projects) to make sure it is still 90 degrees. 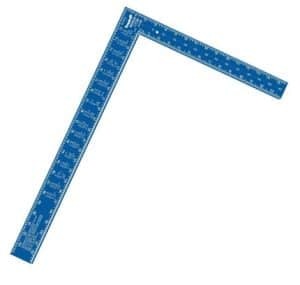 If you are being handed a 24″ framing square on a job site it is not unusual to ask if it is square – in my experience, most are out a bit in very short order. For this reason, I personally never spend a lot on a framing square and usually buy aluminum. Steel is more likely to stay square longer, but they rust, normally only come in a steel finish and are much heavier than aluminum. My advise, buy a light square with easy to read markings at a reasonable price. Before the Speed Square became so popular, this was the most used marking tool in a carpenters tool pouch… and many still use them. The standard combination square has a 90 and 45 degree edge and 12″ or 16″ rule. These type of squares remains surprisingly accurate provided you buy a decent one! Their limitation in framing projects is the short length of the body (blue piece in the picture shown). The rule itself is handy and I frequently will pull out the rule for marking off materials or to check the depth of a cut etc. Of course, they are still a great tool for layout work, marking studs and so on. But due to the introduction of the speed square, I would not spend a lot on one of these as you probably wont use it as much as the speed square – it is just a very handy tool to have on hand for those times other squares just won’t work. One thing I do recommend, do not buy one with the main body made from plastic – these are junk and won’t last long. Level vials are nice but seldom used. Anything in the $12 to $25 range will suffice. Sometimes the oddest of tools can become that one tool you just do not want to be without – in my case, it is the Shinwa Japanese Square. It is the tool I use to make sure all my other tools are setup square, or at 45 degrees. I use this square to check if saw blades are square to the table top or base, miter saw setup, jig saw and almost all my tools where this is critical. While it may not be accurate enough for a machinist, it is more than accurate enough for any woodworker. This is real gem. With the base flange, It can be placed on a table saw top or miter saw base leaving your hands free to make adjustments. The hole in the middle is great to hold it in place on a circular saw base while you adjust or tighten the angle settings. The markings are a little odd and the measurements do not start at the inside of the flange as you might expect – So I do not use the measurements on this square for any kind of layout work – strictly tool setup, mainly saws. It may only have 45 and 90 degree faces but these are the most common and for this purpose, it works great. Of all the tools listed here, if this one is missing, I will hunt it down! It is just too handy to not have on hand.